"URGENT!! 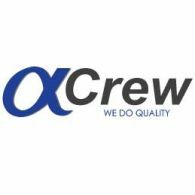 - MASTER- CREW BOAT - 200 USD p/d Rank: Master; Vessel: CREW BOAT; Contract: 3 months +/-1; Salary rate: 200 USD p/d; Area: KSA; Requirements: - Good English, - 2 years experience on same type of vessels; To apply for this job, please, visit https://my.alphacrew.com/job/4445 and fill up online form. Tel: +380482371957 ext. 104; email: cv@alphacrew.com "